Belle vue panoramique sur la baie de Voile! Spacieux Deck / w privée et jacuzzi! Cette magnifique baie avant quatre chambres en copropriété est situé sur Mission Bay. Il a de magnifiques vues panoramiques de la grande terrasse privée, chambre de maître, salle de séjour, et un jacuzzi extérieur. Les espaces de vie et les chambres sont très spacieuses et joliment décorées. Profitez d'une merveilleuse balade à vélo sur l'un des vélos inclus dans votre location de condo. À distance de marche de l'océan, des restaurants et des boutiques. Ce condominium de luxe a tout ce dont vous avez besoin pour profiter d'un séjour merveilleux et relaxant sur la plage. Nous avons aussi un magnifique penthouse condo de 3 chambres situé dans cet immeuble de 3 unités. S'il vous plaît se renseigner dès aujourd'hui! Toutes les salles de bains sont très spacieuses et ont été récemment mis à jour avec de nouveaux carreaux dans les zones de toilettes privées. La 1ère salle de bains principale contient un espace étonnant de placard, pommes de douche double, grande baignoire et un coin toilette privé. 2ème salle de bains principale contient têtes double d'eau dans une grande douche de plain-pied. 3e salle de bain est très spacieuse et avec baignoire / douche dans la grande zone de toilettes privées et la zone lavabo séparé. 2 off-street parking et aire de garage pour le stockage de vélos, ascenseur, jacuzzi privé sur le pont surplombant la baie, à proximité de sports nautiques centre de location, très grande salle de bains principale, des espaces de vie spacieux et salle à manger; une vue panoramique sur la baie de voile à partir de zones de vie, chambre principale et terrasse privée. A wonderful, large condo with great location and access. This condo was perfect for our large blended family with 2 adults and 4 kids ranging from 17 to 10. Spacious (even more so than the pictures display) and with all the amenities around. Rooms were comfortable, deck was beautiful with views, grill and hot tub. The only thing I would comment on would be the kitchen, which, though spacious, was not quite as up to date as one would have wished. The microwave became possessed about 4 days into our trip, flashing and zapping for no good reason, for about an hour, and after that was considered verboten by us all. From the get go, however, Kelly was forthright and helpful. A confusion in booking was quickly and easily cleared up, and then followed instructions and regular communications (though not too many, for which I was grateful). We were pleased with every aspect of the rental, and marveled at finding such a beautiful space so near to the water. Plenty of towels, working washer and drier to replenish our resources, large fridge and pantry to store our snacks. If we come back to San Diego, we will surely seek out this place again. This is the second year we spent the month of November at the condo. Everything is as described in the listing and it works just perfectly for our family. There is rarely anything that goes wrong but if it does or if you have a question you can text Kelly and she gets back to you almost immediately. Someday I hope they will remodel the kitchen. I would enjoy solid surface countertops and new appliances. There is nothing wrong with what is there I would just enjoy a more updated kitchen. I can recommend this unit without hesitation. I wish we could stay more frequently! We have stayed several times at unit 2 and thoroughly enjoyed our time on Sail Bay. The unit is very comfortable with great access to restaurants and grocery stores either via car, walking or biking. Kelly has been very accommodating to any concerns and needs that we might have had and we look forward to our return visit in 2017. We stayed here the month of November 2015. We had marvelous weather. This is a spacious condo in an excellent location. The deck and views are outstanding. This is the 2nd floor of a 3 bdrm unit. Having an elevator made it accessible to a friend in a wheelchair who visited a couple of times. The kitchen is getting pretty old but is certainly functional. The oven is kind of small which we would have never even noticed but since we were there over Thanksgiving we had to watch the turkey size. The kitchen was stocked with most anything we needed (pots, pans, etc.) to be able to cook. A minor annoyance...there were many many spoons and knives but only 11 forks (5 dinner and 6 salad). It was irritating to continually have to wash some forks so we could eat. I felt the carpet really needed to be cleaned. I'm sure it is difficult to keep that up with a rental. Kelly was very responsive to our needs. I hope we will be able to return again and again. Kitchen has been stocked with new silverware and some fun new serving pieces. All carpets have been freshly cleaned and are now on a regular cleaning schedule. Please see our new photos of the condo as of Jan 2016. We have stayed at this facility for the last four years. 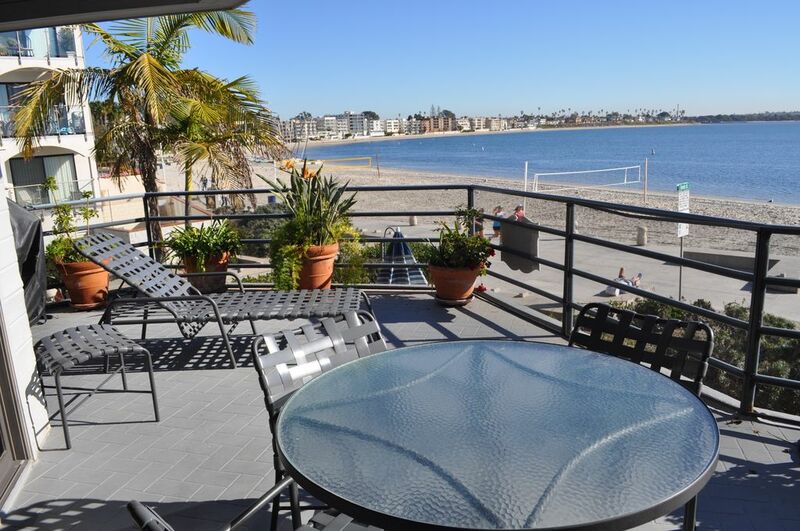 (About two months at a time) It is a great location to walk to PB restaurants or ride bikes around the boardwalk and ocean beaches. It is not as busy/hectic as the ocean side, which is more our style these days. It is about a block from a great kids park (Fanuel). You can rent about any water toy within a 15 minute walk. Easy to get to the airport and downtown. Kelly has always been responsive to any issue that might arise. Belmont Park is close as is Sea World. Have signed up to stay again in 2016!